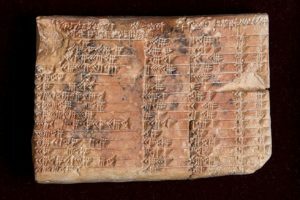 3,700-year-old clay tablet has proven that the Babylonians developed trigonometry 1,500 years before the Greeks and were using a sophisticated method of mathematics which could change how we calculate today. The tablet, known as Plimpton 332, was discovered in the early 1900s in Southern Iraq by the American archaeologist and diplomat Edgar Banks, who was the inspiration for Indiana Jones. The true meaning of the tablet has eluded experts until now but new research by the University of New South Wales, Australia, has shown it is the world’s oldest and most accurate trigonometric table, which was probably used by ancient architects to construct temples, palaces and canals.However unlike today’s trigonometry, Babylonian mathematics used a base 60, or sexagesimal system, rather than the 10 which is used today. Because 60 is far easier to divide by three, experts studying the tablet, found that the calculations are far more accurate. “Our research reveals that Plimpton 322 describes the shapes of right-angle triangles using a novel kind of trigonometry based on ratios, not angles and circles,” said Dr Daniel Mansfield of the School of Mathematics and Statistics in the UNSW Faculty of Science. “It is a fascinating mathematical work that demonstrates undoubted genius. The tablet not only contains the world’s oldest trigonometric table; it is also the only completely accurate trigonometric table, because of the very different Babylonian approach to arithmetic and geometry. “This means it has great relevance for our modern world. 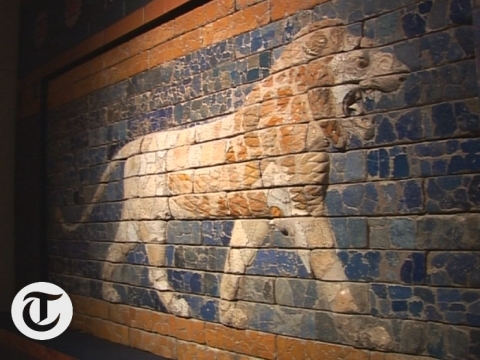 Babylonian mathematics may have been out of fashion for more than 3000 years, but it has possible practical applications in surveying, computer graphics and education. The Greek astronomer Hipparchus, who lived around 120BC, has long been regarded as the father of trigonometry, with his ‘table of chords’ on a circle considered the oldest trigonometric table. A trigonometric table allows a user to determine two unknown ratios of a right-angled triangle using just one known ratio. But the tablet is far older than Hipparchus, demonstrating that the Babylonians were already well advanced in complex mathematics far earlier. “Plimpton 322 predates Hipparchus by more than 1000 years,” says Dr Wildberger. “It opens up new possibilities not just for modern mathematics research, but also for mathematics education. With Plimpton 322 we see a simpler, more accurate trigonometry that has clear advantages over our own. The left-hand edge of the tablet is broken but the researchers believe t there were originally six columns and that the tablet was meant to be completed with 38 rows. “Plimpton 322 was a powerful tool that could have been used for surveying fields or making architectural calculations to build palaces, temples or step pyramids,” added Dr Mansfield. The new study is published in Historia Mathematica, the official journal of the International Commission on the History of Mathematics. Next post: How is what3words able to provide accurate address of every location?